This is a russett colored mohair teddy that is 5-way jointed. He is the emperor of the Enchanted Forrest. A kind and fair ruler who is loved and respected by all those who live in his kingdom. 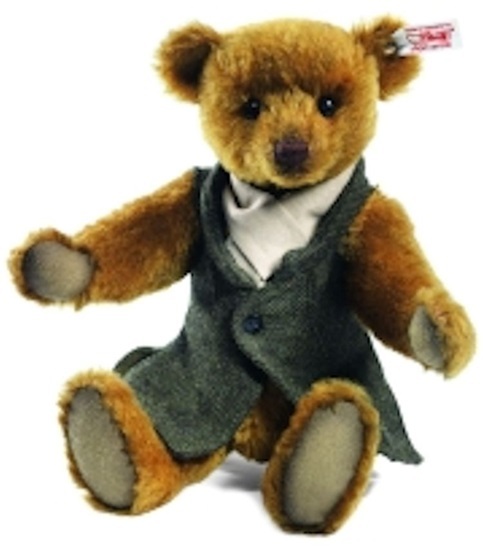 He is Forrest, a magnificent Teddy made from finest reddish blond mohair. He is wearing a tweed waistcoat of fir-green which makes his mohair shine even more. A scrim scarf with golden threads hangs casually around his neck. Subtle airbrushing adds to his regal appeal. His paw pads are a unique green beige color - utilizing the back side of the mohair. Add a touch of royalty to your collection with Forrest .